Religion and traditional performing arts in Bali are two fields that are not separated as cultural identities that make Bali famous in the eyes of the world and admired as being able to create peace and prosperity. Based on consideration of Hinduism and the traditional performing arts, tourists arrive to visit Bali. 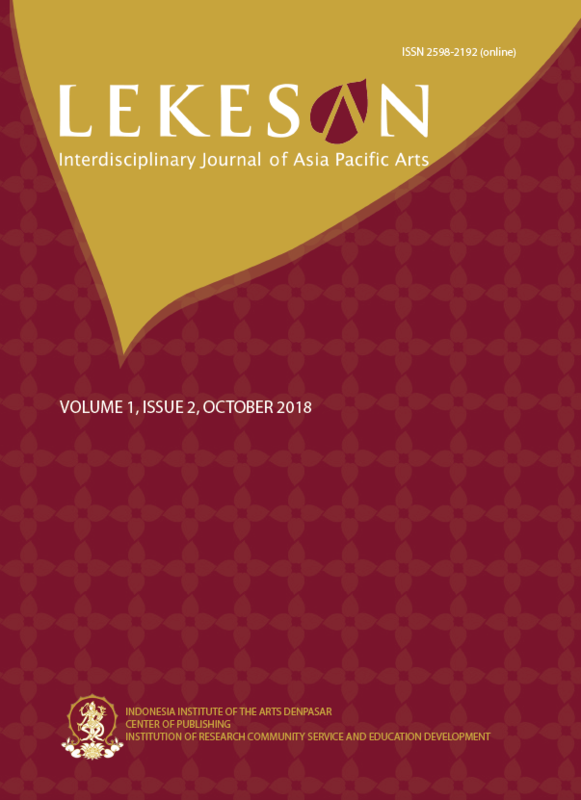 Therefore this paper aims to analyze the relationship between Hinduism and traditional performing arts and its relation to tourism development, as well as the impact it has on the social phenomena of Balinese society. There is an interest in maintaining the relationship of Hinduism with traditional performing arts as part of a whole religious ceremony with the development of tourism, but there is a very strong stream of commercialization, which can destabilize the relationship between Hinduism and the life of the performing arts. This inequality is a problem that needs to be studied because it is not uncommon for the packaging of sacred art to become a tourist art, thereby reducing the importance of traditional performing arts’ sacredness. The effort to counteract the aforementioned problem will be the main focus that will be studied in this paper. The method used to examine the problems above is qualitative research methods based on the historical paradigm. The historical paradigm understands changes through sources, documents, artifacts, texts on performing arts and observations and interviews in connection with the current conditions. As an analytical tool, the concepts of ideology, communication and acceptance are used. The results of this writing indicate that there is a cultural ideology, namely the classification of performing art and the concept of cultural tourism to counteract the negative influence of tourism on Hindu religious life and Balinese culture. Denzin, Norman K dan Yvonna S. Lincoln, 2009, Hand Book of Qualitative Research. Jakarta: Pustaka Pelajar. Geriya, I Wayan, 1989, Pariwiasata dan Dinamika Kebudayaan Nasional, Global: Bunga Rampai Antropologi Pariwisata. Denpasar: Upada Sastra. Goris, R en Walter Spies, 1937,” Overzich van Dans en Toneel in Bali”, dalam Madjalah Djawa No. 5-6, tahun ke-17. Hasil-Hasil Seminar, Seni Sakral dan Profan, Bidang Tari, tanggal 24-25, Maret 1971. Denpasar: Proyek pemeliharaan dan Pengembangan Kebudayaan Daerah Bali. Tijdschrift XIe Jaargang. Amstredam: N.V. Drukkerij en Uitgeverij J.H. de Busy, Mei 1938-1 April 1939. Kats, J, 1924, “ Barong op Bali”, dalam Madjalah Djawa, Veerde Jaargang. Lauer, Robert. H, 1989, Perspektif Tentang Perubahan Sosial (terjemahan). Jakarta: Bina Aksara. Peraturan Daerah Bali No 3 tahun 1974, Tentang Penetapan Bali sebagai Daerah Pariwisata Budaya. Radcliffe-Brown, A.R, 1965, Structure and Function in Primitive Society. New York: A. Pree Press Paperback Edition. Soekawati, Tjokorde Gede Raka, 1925, “De Sanghyang op Bali”, dalam Madjalah Djawa, tahun ke-4. Java Institut. Team Universitas Udayana, 1977/1978, Penanggulangan Pengaruh Negatif Kebudayaan Asing Terhadap Kebudayaan Bali. Denpasar: Proyek Sasana Budaya Bali.